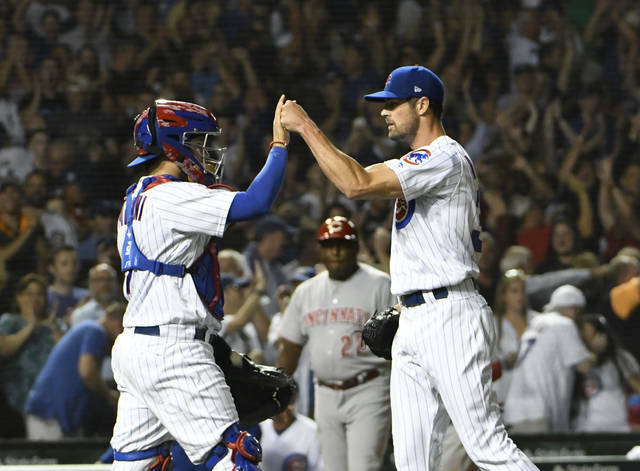 CHICAGO (AP) — Cole Hamels tossed a complete game to continue his dramatic turnaround with the NL Central-leading Chicago Cubs, who got home runs from Anthony Rizzo and Javier Baez in a 7-1 victory over the Cincinnati Reds on Thursday night. 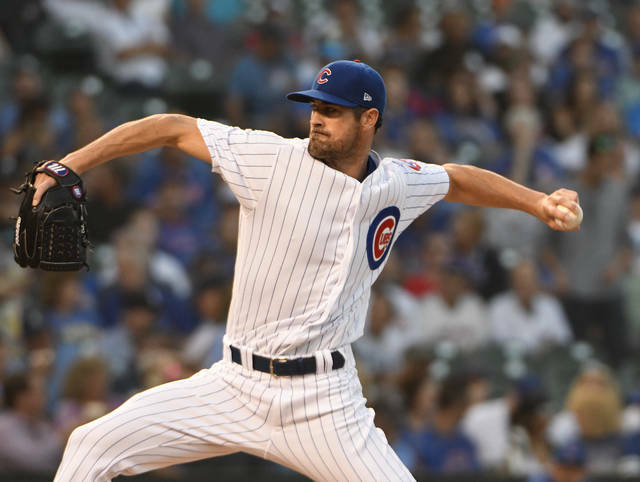 Hamels (4-0) allowed eight hits, struck out seven and walked two in his 17th career complete game and the first by a Cubs pitcher this season. His ERA in five starts with Chicago is 0.72. Before being traded to the Cubs, the veteran left-hander was 5-9 with a 4.72 ERA in 20 starts for the Texas Rangers. Rizzo went 2 for 2 with a walk and three RBIs. 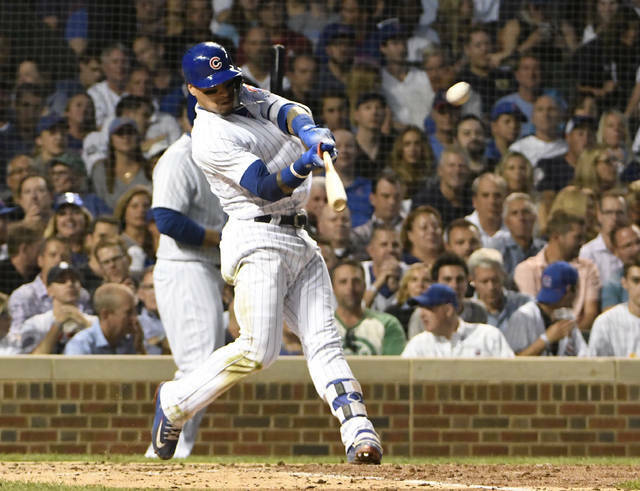 Baez was 3 for 5, reached on an error and scored three runs. The homer, his 27th, was a mammoth 481-foot solo shot that cleared the bleachers just left of straightaway center and landed on Waveland Avenue. He also turned in a stellar defensive play at shortstop, backpedaling and diving onto the outfield grass to snag a soft liner by Dilson Herrera to end the seventh. Hamels had allowed just two earned runs in his first four starts with Chicago, but the Reds jumped out to a 1-0 lead in the first as Phillip Ervin beat out an infield single with two outs, scoring Billy Hamilton from third base. The Cubs quickly answered. After Baez reached on an error with one out, Rizzo hit the first pitch he saw from starter Anthony DeSclafani (6-4) into the bleachers in right for a 2-1 Chicago lead. Baez’s homer in the third made it 3-1. In the fifth, Baez doubled with one out, advanced to third on a wild pitch and scored on Rizzo’s sacrifice fly to stretch the margin to 4-1. The Cubs then broke it open with three runs in the seventh. Cincinnati loaded the bases with one out in the ninth, but Hamels got Tucker Barnhart to ground into a game-ending double play on his 114th pitch. The Cubs placed RHP Tyler Chatwood on the 10-day DL with left hip inflammation. The move is retroactive to Tuesday. RHP Dillon Maples was recalled from Triple-A Iowa. Chatwood, 28, has struggled with his control after signing with the Cubs as a free agent in the offseason. He is 4-6 with a 5.22 ERA in 23 games (20 starts) with 93 walks in 101 2/3 innings. Reds: RF Scott Schebler (sprained right shoulder) continued his rehab assignment with Double-A Pensacola. Cincinnati manager Jim Riggleman said Schebler will travel to Chicago on Friday and be activated on Saturday. Cubs: RHP Yu Darvish (stress reaction right elbow) is out for the season but said he is relieved doctors finally discovered the source of his elbow pain. “At first, I was told it was a simple tightness, but I always knew there was something else other than the tightness,” he said through a translator. . 3B Kris Bryant (left shoulder inflammation) is expected to increase the intensity of his swings during a batting practice session Friday. The Cubs will recall RHP Alec Mills from Triple-A Iowa to start the second game of the series Friday. Mills has pitched two scoreless innings of relief for Chicago this season. The 26-year-old is 5-12 with a 4.84 ERA in 23 starts at Iowa. RHP Matt Harvey (6-7, 4.91 ERA) goes for the Reds after taking a no-hitter into the sixth inning during his last start.